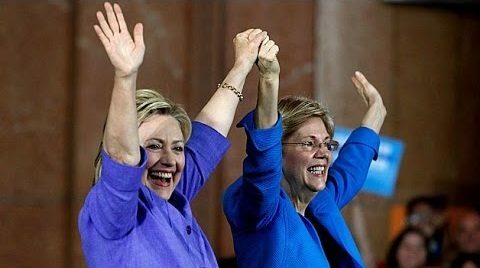 Elizabeth Warren is on Hillary’s short list for VP. The woman who, famously or infamously depending on your point of view, began the “You didn’t build that” meme of the Obama regime and whom the people of Massachusetts senselessly elected to the U.S. Senate (just as they elevated the most unqualified anti-American in history to the White House!). The anti-capitalism of the Democrat Party has been the guiding force of America’s decline over the past ten years and their slanders of one of America’s greatest entrepreneurs in a symptom of their corruption and intent. Hillary slanders banks in her speeches to her mindless drones while she’s taken over $20 million in speaking fees from them. If you’ve heard her speak then you wonder how this could be. How could she make a hundred times what any other motivational speaker ever has when she is the most dull, insipid, pointless speaker they’ve ever heard? The answer is the same as the reason that foreign governments have given her foundation over $100 million dollars – to buy influence in her government. The tragedy of America is that her voter slaves are perfectly okay with her corruption and cronyism, that they actually endorse her doing what she accuses Republicans of being guilty of doing. They look the other way because she carries on the Obama tradition of throwing them table scraps in the form of welfare, food stamps, and other goodies courtesy of taxpayer dollars. Then she tells her vacuous supporters that Trump is in bed with the banks and wants to re-institute Glass-Stiegel and allow them to make “predatory loans” to cause another mortgage crisis market crash. Glass-Stiegel was her husband’s program to force banks to make loans to people who couldn’t pay it back. The mortgage crash happened because he gave them an out by allowing them to sell the bad loan to unsuspecting fools. Meanwhile, Senate Minority Leader Harry Reid (D-NV) is the one who reintroduced Glass-Stiegel in Congress. Yet Clinton’s voter slaves are convinced Trump is in bed with banks and will steal from them. Obama has been giving banks hundreds of billions of borrowed taxpayer dollars over the last eight years doubling the national debt to $20T! In addition, he kept those payments off the books by not publishing a budget for six of those years – it’s insane! Obama and Hillary’s domestic economic policy has been to use the EPA to shut down oil drilling and coal mines putting thousands out of work. Their increase in taxes through ObamaCare and other policies have caused an economic downturn not seen since the Great Depression. The Great Obama Depression 2009 – present is as much the fault of Hillary, and the backwards thinking of people like Elizabeth Warren. Fauxcahontas doesn’t know from where people got money to pay taxes for what “the rest of us paid for!” She believes government magically enabled businesses to come into being by providing what they needed. More like she believes businesses should only be created under Democrats so long as they grease the palms of the power brokers. Hillary announced her intention to continue these Obama policies to the cheers of oblivious zombies who on hear what she says without knowing what she and Obama have been doing. The Benghazi report liberals won’t bother to read. They exonerate Hillary before they know any facts. Four Americans are dead under her watch to whom she sent no help and to whose families she lied. She publicly blamed the attack on an unknown video then told her daughter in private that it was a planned terror attack of which she had forewarning. All the liberal media is concerned about is not the facts that condemn her, but how they can help cover it up to protect her as they have been Obama. The foreign policy of Obama and Hillary is what set the Middle East on fire. His support of the Islamist Muslim Brotherhood to overthrow rulers in the Middle East has opened the way for ISIS, which is Al-Qaeda fully militarized to conquer western Iraq and take control of Libya and other countries. Egyptians overthrew their Muslim Brotherhood dictator, but Libyans, whom Obama and Hillary assisted in killing Qaddafi, attacked the American embassy in Benghazi in an attempt to kidnap our ambassador. The attempt was thwarted by the courage of Navy SEALs who contracted to protect the embassy, but two of their own and the ambassador and a tech were killed in an action that saw no rescue efforts by the Obama regime. Now we have Iran in Iraq, Russia in Syria, ISIS in Libya, and a hundred other war fires burning where there were none when Obama took office. The actions of Obama and Clinton have caused the decline of America and the resurgence of the Jihad! And at her campaign rallies Democrats cheer for them. False ProphetsSupreme Court 2016: Where are the Conservatives?